Crunchy, tender, sweet, savory, and other opposites. I strive for peace on Friday around dinnertime. I strive, and I hope, and sometimes it’s a big, fat failure with bickering or takeout pizza (sins of equal weight somehow). And tonight, the mister was still at work, and I had no meal planned after just arriving home at the time I’d prefer to be blissfully blessing the wine and gazing at my dressed and brushed children over a lovingly prepared meal that they’d eat with the gusto reserved for macaroni and cheese. The only saving grace was I knew I had some frozen challah. So, yeah, it was a bust already, right? So me and my what-the-hell attitude rummaged in the kitchen. And I came up with a practically defiant chicken salad. My ladies have never seen chicken salad before, but it’s a trifecta of pickiness – a (1) mixture of ingredients (2) touching each other (3) in a sauce. Oh lord. To the table, I added the challah, a plate of grapes, and cheese sticks so that when faces recoiled in disgust, I couldn’t be accused of starving my children. Now the little one gave a good college try of two solid bites, and only one slight gag. I call that a homerun. We watched the candles standing tall with only a very occasional flicker, we talked about the giant pile of garbage floating in the Pacific, and we laughed at the little one’s potty jokes. Just as Shabbat is meant to be. Go easy on the dressing, and don’t leave out that brown sugar – it’s a definite secret ingredient sort of enhancement. Whisk together ingredients for the dressing. In a separate bowl, combine the salad ingredients. Add half of the dressing, stirring gently, and then add more to your taste, careful not to oversaturate the salad. Lay some Romaine leaves on a plate, and serve a scoop of the salad in the center. 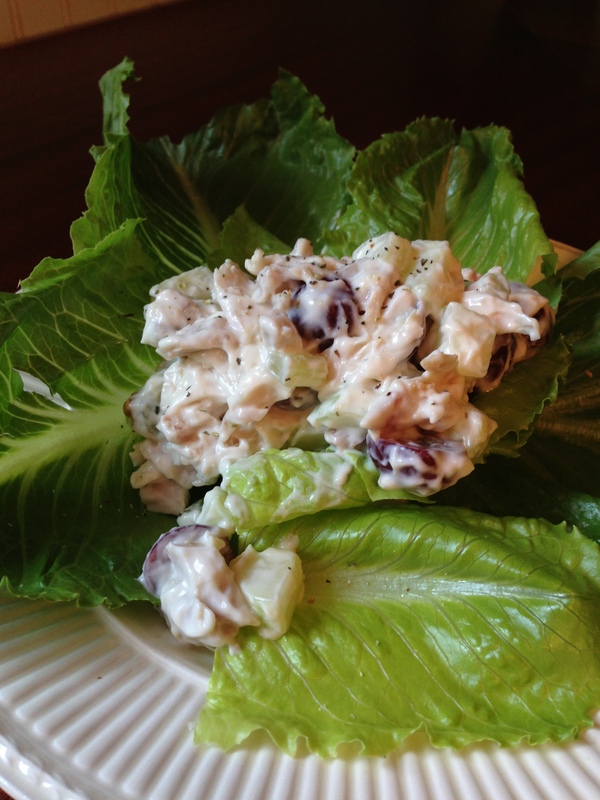 The leaves can be used like taco shells, and just like that, chicken salad is a finger food! In 2012, we joined a local organic Community Supported Agriculture (CSA) farm in Tampa. Every other week, we’d pick up bags of wonderfully fresh vegetables, some of which I’d never heard of before. Tatsoi? Dino Kale? Hakurei turnips? Needless to say, our palettes expanded, and sometimes I struggled to find ways to use our produce. Like the radishes. One or two, I know how to handle (chop up in a salad – easy enough! ), but eight? Ten? Thankfully, I found two different cold salad recipes through Pinterest that allowed me to use the radishes in really delicious ways. This one is based on a Weight Watchers recipe and is such a wonderful and refreshing summer dish. Tangy citrus, fragrant mint, sweet melon, crisp and slightly spicy radishes all combine into a beautiful and healthy salad. While the original recipe calls for the veggies and melon to be sliced on a mandolin, I chose to dice the cucumbers and melon and thinly slice the radishes. Scooping the melon with a baller would also work. 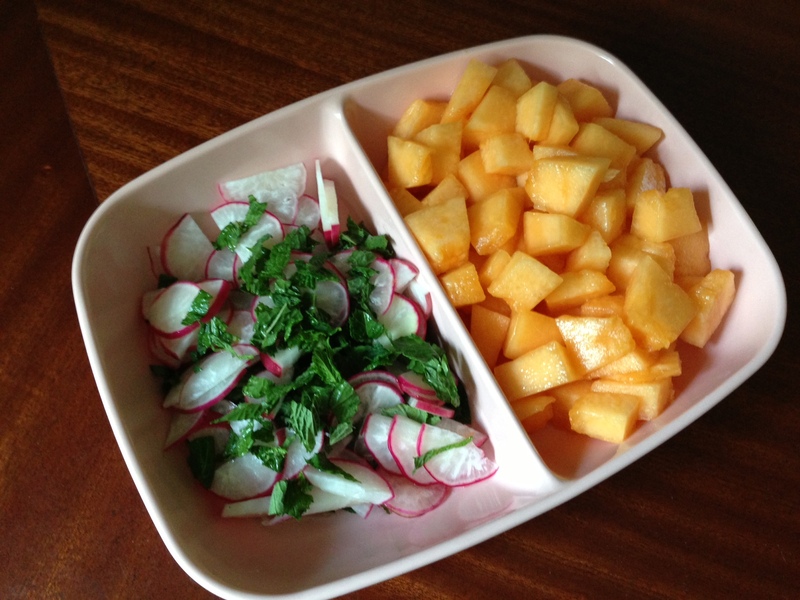 The recipe also calls for honeydew, and as you can see in the photo I sometimes use cantaloupe. They are equally delicious. Sometimes I deconstruct the salad for little palettes that aren’t keen on radishes or mint yet. They inhale the melon and cucumber. Combine all ingredients in a bowl and chill for at least two hours before serving. Whisk together all ingredients until blended. Drain and rinse all beans. Put beans in a bowl and add onions. Mix oil, vinegar, sugar, basil, tarragon, parsley, dry mustard and salt and pepper. Pour over beans and onion and refrigerate for 24 to 48 hours. The ingredient amounts in this salad are completely flexible, as are the ingredients themselves. Dried cranberries instead of raisins, or almonds instead of sunflower seeds make interesting variations. The dressing is the same as the dressing for the Waldorf Salad, but it should be a bit sweeter and not as thin, according to Mary Kay. Chop up the cheese into rough cubes or slivers. Slice the fresh basil leaves. Combine the cheese and basil with the tomato halves. Toss everything with the dressing. It can sit or be served immediately. Arrange tomatoes and cheese in a 13×9 dish. Combine remaining ingredients in a jar. Cover tightly, and shake vigorously. Pour dressing over tomato mixture. Cover and chill at least four hours.